Like it or not smartphone photography is not only here to stay it has become the dominant force in photography. As our iPhone’s and Androids become more able bodied cameras we are coming to expect more from them. These new camera expectations are delivering new twists on classic photographic equipment and gear. To that end this page is dedicated to tripods. Not DSLR tripods but smartphone tripods. Not long ago the best iPhone and Android tripods were cheap flimsy imports. Those days are gone. 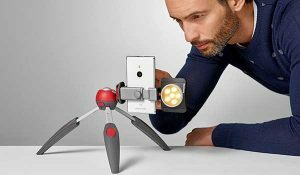 Today mainstream tripod makers are designing and producing premium smartphone tripods and tripod accessories on par with their DSLR offerings. This is a good thing. This page is dedicated to professional quality smartphone and iPhone tripods. There are some photography equipment manufacturers that are almost always a safe bet for spending your hard earned money one. Manfrotto is part of the Vitec Group which includes other familiar brands such as Gitzo, Lastolite, Colorama, Avenger and National Geographic Bags. 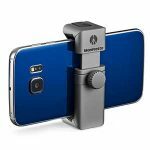 Manfrotto is my “Go To” for DSLR Tripods and now smartphone tripods too. 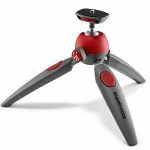 Manfrotto PIXI EVO 2 Section Tripod – A wide range of shooting options for the mobile photographer. The PIXI EVO 2-Section Mini Tripod is compact enough to carry with you and offers diverse framing possibilities for your photographer work.Extremely lightweight and compact, the PIXI EVo 2-Section Mini Tripod is perfect for transportation. Combined with its sturdy aluminum structure, and you’ve got a reliable piece of equipment you can count on throughout your photography career. The kit also boasts two different leg angles complete with sliding selector. Additional features include the two-section legs that can be adjusted in five simple steps. This will improve your stability on uneven surfaces. You’re sure to maintain that perfect shot thanks to this innovative technology. When looking for the right angle, the PIXI EVO 2-Section Mini Tripod is made to help. The camera can tilt to a full 90°, ideal for taking your pictures and recordings in portrait mode.Developed for entry-level DSLRs, this kit supports a wide range of devices up to 2.5Kg. This wide range compatibility gives you the freedom to use cameras and accessories of your choice. This choice is also available to you in terms of colour. The PIXI EVO 2-Section Mini Tripod comes in white, black and red-anthracite. Manfrotto Lumimuse Led Light Source – The Manfrotto Lumimuse series of cold shoe lighting is available in 3 LED, 6 LED and 8 LED configurations. The Lumimuse is bright while remaining compact enough to fit in a compact camera kit. Despite its size, the Lumimuse can fit itself into many shooting situations for both stills and video. To control the light output, 3-4 step dimming is available. To change the quality of the light output, a snap-on filter kit comprised of color temperature and diffusion filters is included. For more options, additional filters are available separately. The Lumimuse is powered by an internal rechargeable Lithium-Polymer battery for about 60 minutes of battery life and can be secured to your camera directly with the included shoe mount. Another option is to use the 1/4″-20 tapped hole on the shoe mount to position the light off-camera, either on a tripod or on another accessory like a magic arm. Manfrotto LUMIMUSE Accessory Ball Head – The LUMIMUSE Ball Head (included with the Limimuse LED lights, is designed specifically for the LUMIMUSE series LEDs and is compatible with the full range. The Ball head allow you to mount either on the hot-shoe of a camera or even on a tripod or alternative supports, using the 1/4 ” screw thread on the underside. The head is friction based and enables 360 Degree pan movement and up to 35 Degree in the vertical providing you with the ability to control the direction of your light in a simple, rapid way.